A typical robot does not know that you must never shake a baby. And a typical robot just doesn't have a tender touch. 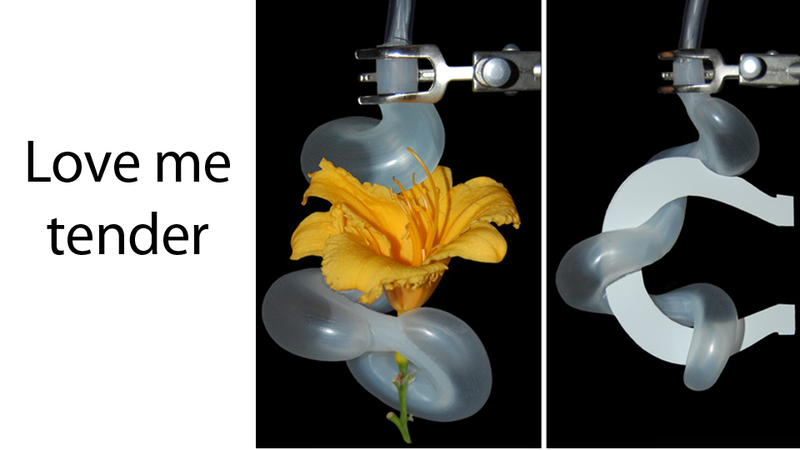 But now scientists at Harvard have developed a robotic tentacle so gentle that it can wrap around flower without breaking it. The tentacle is made from flexible plastic containing three air channels that run along the entire limb. Selectively pumping air into these channels causes the tentacle to bend, allowing it to curl around objects with a light grip. Splitting the air channels into multiple sections lets separate parts of the tentacle bend in different directions, producing a full 3D range of movement.